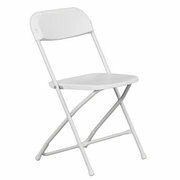 Suitable for both indoor and outdoor events, these sturdy white plastic folding chairs are lightweight, easy to handle, and simple to transport. Manufactured using high-impact plastic and 18-gauge powder coated metal frames. $1.50/each plus tax per day!